‘During a fit of temporary insanity Harry W. [sic; the photograph caption, moreover, gave ‘Henry N. Pillsbury’.] 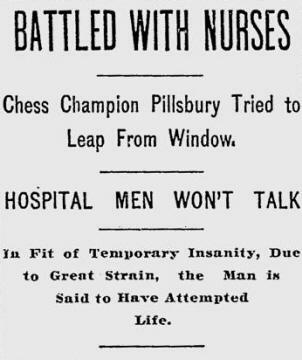 Pillsbury, the American champion chess player, tried to plunge through a fourth story window of the Presbyterian Hospital last night, and was overcome only after a desperate encounter with several nurses, doctors and hospital attachés. One nurse, who arrived first on the scene on hearing the sound of breaking glass and seized [sic] the frenzied man, was felled to the floor. Only the arrival of reinforcements prevented a tragedy. Unknown to many of his wide circle of acquaintances, Pillsbury has been a patient at the West Philadelphia Hospital since last Sunday, at which time he went there to have an operation performed. 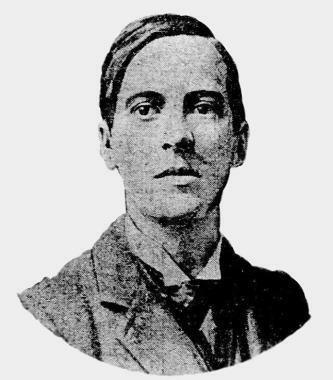 As he had been looking forward with eagerness to playing on the American team in the annual English-American cable chess match, which opens on 15 April, he was nervously anxious to recover as quickly as possible. No one at the hospital today would discuss the subject of Pillsbury’s outbreak. All the attachés were instructed not to say a word to inquirers. It was even impossible to ascertain the condition of the famous chess expert, although early in the day an attaché said he was in a precarious state. It is said that besides a few cuts from the glass in the window through which he tried to jump, Pillsbury was not marked, but it is believed the shock may prove disastrous as yesterday was the turning point in his condition following the operation. Chess players were amazed today on hearing of the episode which almost took the life of one of the most brilliant players the game of chess has produced, the man who held the record of playing 28 simultaneous games [sic]. It was recalled in this connection that Steinitz, a famous player of his time, died in a mad house [sic], having been driven insane by the game to the mastery of which he had devoted his life. A New Englander by birth, Pillsbury has been a resident of Philadelphia for about five years. He is about 33 years old, and made his home in the Atlantic Apartment House, at the N.E. corner of 11th and Winter sts., where he occupied rooms on the fourth floor with his wife, who was formerly Miss Bush, of Brooklyn. Mrs Pillsbury is a beautiful woman. From other sources it was learned that Pillsbury came to the hospital on Sunday and was operated on the next day. He occupied a room on the fourth floor, overlooking the corner of 39th and Filbert sts. He had a private male nurse. The operation was thought to be successful, and yesterday was the turning point of the patient’s condition. About 7.30 o’clock last night those on the fourth floor of the hospital were startled by a sound of crashing glass and a nurse who had just been in Pillsbury’s room ran to that apartment. The chess player had broken the glass in the window with his fists and when the nurse appeared he was trying to force his way through the shattered pane. The nurse grabbed him by the legs, pulling him back, but Pillsbury, who evidently was not responsible for his actions, swung his arm around and knocked the nurse to the floor. Two other nurses and an orderly arrived at this juncture and all seized the demented patient. Others arrived and there was a desperate encounter before Pillsbury, with the heruclanean [sic] strength of a man temporarily beside himself, gave his captors the struggle of their lives. But they finally overpowered him and sedatives were applied to quiet him. Beyond a few cuts Pillsbury was unmarked, but it was the shock of the outbreak and struggle that worried the caretakers. Before Pillsbury had been quieted by sedatives administered hyperdermically he raved about chess in the wildest fashion. He called out moves in a game of his imagination and it was only with the greatest difficulty that he was finally quieted. The outbreak created consternation in the ward outside of Pillsbury’s room. Several of the women patients screamed outright in their terror, and the nurses, who had been aiding in the subduing of Pillsbury, had to run to them to prevent a panic. A later report of the matter had it that Pillsbury walked out of his room waving his arm wildly over his head and uttering chess movements [sic]. He entered the room of a woman patient and she, terrified, rang her bell for assistance, and her nurse responded at once. Pillsbury’s male nurse also arrived at this juncture and the two managed to drag the temporarily insane man back into his room. Then it was, according to this account, that Pillsbury broke away and tried to get through the window. 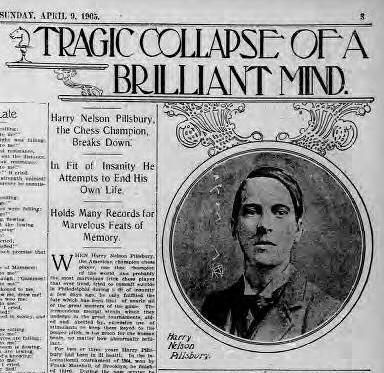 ‘While critically ill as a result of a delicate operation, Henry [sic] Nelson Pillsbury, the American champion chess player, became temporarily insane on Thursday evening last at the Presbyterian Hospital. 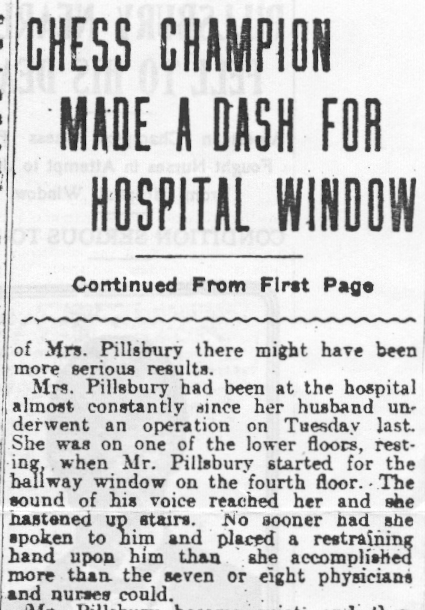 While physicians and nurses were trying to prevent the crazed man from reaching a fourth-story window Mrs Pillsbury arrived, and at the sound of her voice her husband quieted down almost instantly. He permitted Mrs Pillsbury to lead him back to his bed, and yesterday was reported to be improving. The first intimation the attending physician had that his patient had become irrational was when he entered the chess player’s room and found him dressing himself. The physician remonstrated with Mr Pillsbury, but the latter said that his friend, Attorney Walter Penn Shipley, was giving a ball at the Bellevue Stratford and that he had promised Mrs Pillsbury to take her there. Perceiving at once that Mr Pillsbury’s mind was wandering, the physician humored him until the chess player finally agreed to abandon his idea to attend the imaginary ball and permitted himself to be undressed and put to bed again. No sooner had he returned to bed than he informed the nurse in attendance upon him that he was burning up for want of water. She left the room to get him some water, and he followed her. She persuaded him to return to bed again until she brought him a glass of water. Then the chess player complained that the water was full of “strange creatures”. The nurse, realizing that Mr Pillsbury’s condition was becoming more serious, summoned the physician who was looking after him. Together they persuaded him that the water was free of “strange creatures”, and he was about to drink it when he suddenly paused and demanded that he be permitted to draw the water himself. Suddenly he leaped from his bed, despite his weak condition, and succeeded in reaching the hallway, nurse and physician trying vainly to stop him. Other physicians and nurses arrived and they surrounded Mr Pillsbury just as he was making for a window. They prevented him from reaching it, but he became violent, and but for the opportune arrival of Mrs Pillsbury there might have been more serious results. Mrs Pillsbury had been at the hospital almost constantly since her husband underwent an operation on Tuesday last. She was on one of the lower floors, resting, when Mr Pillsbury started for the hallway window on the fourth floor. The sound of his voice reached her and she hastened up stairs. No sooner had she spoken to him and placed a restraining hand upon him than she accomplished more than the seven or eight physicians and nurses could. Mr Pillsbury became quiet, and then he smiled as Mrs Pillsbury seized his hands and slowly led him back to his bed. Later he fell asleep and yesterday was apparently rational again, though extremely weak. “The statement in the papers in reference to Mr Pillsbury’s condition have [sic] been grossly exaggerated. Mr Pillsbury entered the Presbyterian Hospital, one of the best institutions in Philadelphia, on 26 March, for a slight operation for a trouble from which he has been suffering for the past two years. There was nothing unusual in the trouble and the operation is one most customary in such cases. Dr Henry J. Wharton, one of the best surgeons in this city, performed the operation, which was entirely satisfactory, two days later, and Mr Pillsbury was expected to be around again in about a week. His condition following the operation has been favorable, but as is usual in a case of this kind, his diet had to be for a few days restricted. As a result of the lack of nourishment and the effect of the ether, Mr Pillsbury had a delusion on the night of the 30th that he must be present at an entertainment given for him in Philadelphia, and that he must be on hand promptly. No doubt the entertainment that he had in mind was one that was given at the Franklin Chess Club about a week before, at which he was present. Pillsbury got up and dressed himself and started to leave the hospital, when he was interfered with by the nurses. 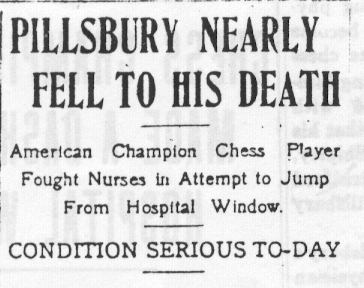 Henry [sic] N. Pillsbury, the American chess champion, tried to jump from a fourth-story window of the Presbyterian Hospital early yesterday morning. He struck down one nurse and fought with several other attendants before he was overpowered and forced back to his bed. It was said last night, and vigorously denied by his friends, that Pillsbury’s mind has become affected by the severe mental strain of his feats at chess, particularly the games in which he participated while blindfolded. Pillsbury entered the hospital as a patient last Sunday, and was apparently then in possession of his full mental powers. An operation, the nature of which the hospital physicians would not divulge yesterday, was performed Monday, and since that time his condition has been somewhat unfavorable. He was guarded night and day by a male nurse. Shortly after midnight yesterday the nurse left Pillsbury’s room for a short time. He was recalled hastily by the sound of heavy blows and crashing glass. The patient had not thought to open the window, but had attacked it with a chair, demolishing pane and sash. When he saw the nurse returning he attempted to launch his body through the aperture. The nurse seized him and pulled him back into the room. Then Pillsbury turned on the attendant in a frenzy and struck him to the floor, just as two other male nurses, a watchman and a doctor, who were attracted by the noise, ran into the room. His muscles strengthened with the strange power of madness, the big chess player was almost a match for the four men. He battled with them for several minutes before he was forced down upon a bed in another room. Sedatives were administered. Attendants at the hospital were very reticent yesterday concerning the matter. They said Superintendent Skeen had ordered them to say nothing about it. Skeen said the chess player did not try to commit suicide. “In a fit of temporary insanity Mr Pillsbury caused a disturbance in his room by trying to jump out the window” was the way he explained it. Pillsbury’s condition was reported yesterday as much improved. Not many of his friends knew that Pillsbury was a patient in the Presbyterian Hospital. He has been living with his wife in apartments at Eleventh and Winter streets, and inquiries there elicited merely the information that he was ill. He was to have played on the American team of chess players who will compete with an English team in a match by cable, beginning 15 April. 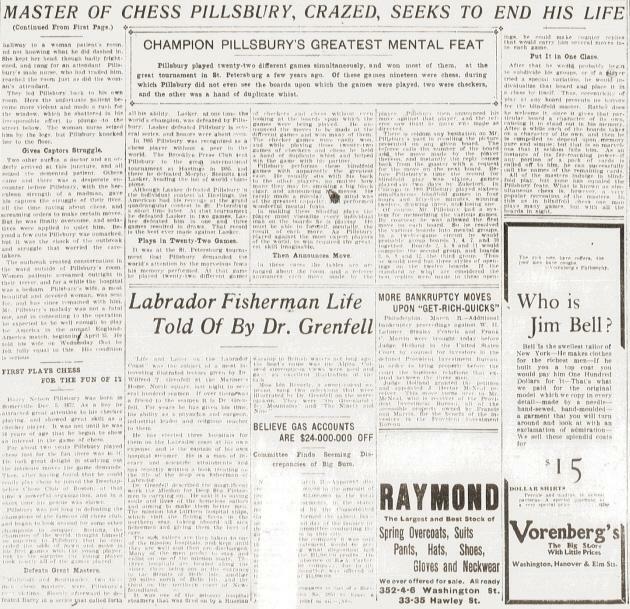 Few chess players have achieved the prominence that Pillsbury achieved by his brilliant victories over American and European masters of the game within the past ten years. Although he has never been world’s champion, he has frequently beaten Emanuel Lasker, who now holds that title, both in tournament play and in off-hand games. Pillsbury’s greatest achievement at chess was his winning of the International Masters’ Tournament at Hastings, England, in 1895, when Lasker, Steinitz, Tarrasch and all the other great players of the time were vanquished by the young American. 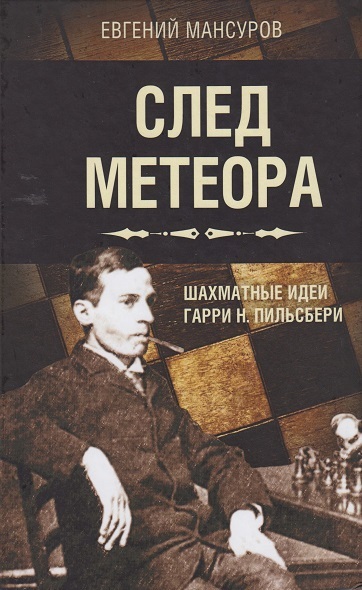 Sled meteora by E. Mansurov (Moscow, 2016). Acknowledgement: Eswara Kosaraju (San Diego, CA, USA).